Is FastestVPN actually the fastest? Read our review and learn about the $1.11 subscription and how you can get one of the fastest performing VPNs. The value of this VPN seems pretty great! When you see the name FastestVPN, you expect speed. You expect the fastest VPN connections, fastest download/upload speeds, and smooth streaming experiences. We’re curious, very curious. Does FastestVPN have what it takes to deliver on their name? Carry on reading this review to find out! You’d expect a VPN calling itself FastestVPN to deliver good speeds. When you use a VPN, you never get your full download speeds because your traffic routing is usually longer. That being said, the better the VPN, the less speed you lose. Those results aren’t bad at all. Although they may not be the fastest VPN in terms of speed, they perform very well in this regard. Nothing to really complain about here unless you have low download speeds to begin with. There’s some gain in ping and minor losses in download speeds to the nearest server – this is a big win. We’re putting this up as a pro, but we’re slightly disappointed we weren’t blown away by incredible speeds. FastestVPN supports torrenting, they even regularly blog about it. Your bandwidth is not capped, and you’re able to participate in torrenting on any of their servers. There are no restrictions or limits in place. Given the admirable speeds above, FastestVPN is great if you want to download large files quickly while remaining anonymous. With that said, it still falls short of our picks for the best VPNs for torrenting. FastestVPN has great pricing and they are always running deals. At the time of writing this, they have a great Black Friday and Cyber Monday deal. If you’ve missed this don’t worry, there’ll be another deal just around the corner. If you’re okay to pay up 5 years in advance, the price above is nothing to be sniffed at! For everything that you are getting with FastestVPN, we think this is a superb offer. We like that there’s a monthly plan for people who don’t want to commit to a year, and the three-year plan is amazing value at $1.11 per month. $1.11 per month on average is definitely “cheap VPN” tier. FastestVPN offer a great range of payment methods to suit almost anybody. From credit or debit cards to PayPal, Apple Pay, and even Skrill, the only ones that seem to be missing at the moment are anonymous payment methods – cryptocurrencies, cash, gift cards, etc. For the most privacy-conscious of individuals, these methods are great because they don’t leave a paper trail. Device Compatibility: Woah, what can’t you use this VPN on? We’re impressed by the range of devices FastestVPN is compatible with. With native support for all the above including Amazon Fire Stick, PlayStation and Xbox consoles, and Android Box, FastestVPN can be used on almost any device. If you decide to install FastestVPN on your home’s router, any device connected to the same network will be protected, even if the FastestVPN software is not running on individual devices. One FastestVPN account can be used on five different devices at the same time, which is about the norm. FastestVPN definitely provides one of the widest device ranges in this price tier. Signing up was a complete breeze and didn’t really differ from any other provider. You register with your email address and pay for your plan. After this, you are sent an email with your password. You can then download the VPN software and sign in with your credentials—done! Downloading and installing the software was finished in less than a minute. We have no complaints here. FastestVPN is very easy to use. When you log in to FastestVPN you’re automatically connected to the most suitable server. To change this, simply click on the country drop-down menu above the yellow Click to Disconnect button to change your location. Settings, Account, FAQs, and a second Locations menu can be found by clicking the hamburger icon in the top left. 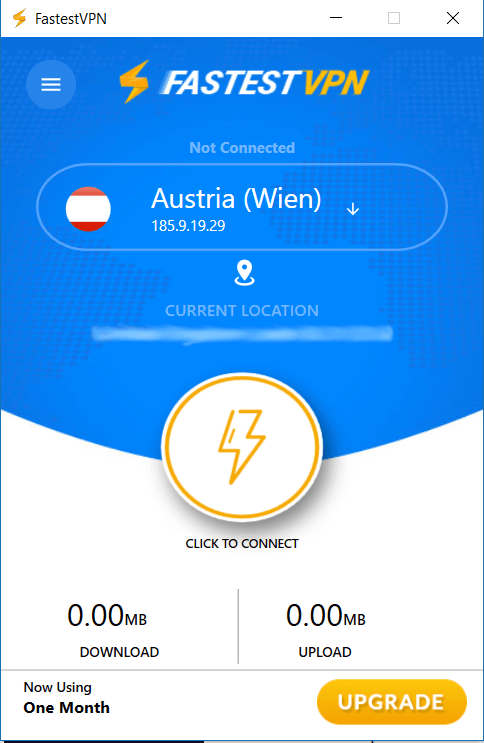 Like many modern VPNs, FastestVPN also uses a one-click connect button. Customer Support: Feel the love, they even have live chat! You can contact customer support either through email or their live chat function on the website. FastestVPN also has an extensive FAQs and knowledgebase section that can be looked at for basic-level queries. In addition to this, there is a blog where they talk about lots of other useful and interesting things. When we used the live chat, we received an instant reply from an agent who answered our simple question in a matter of seconds. 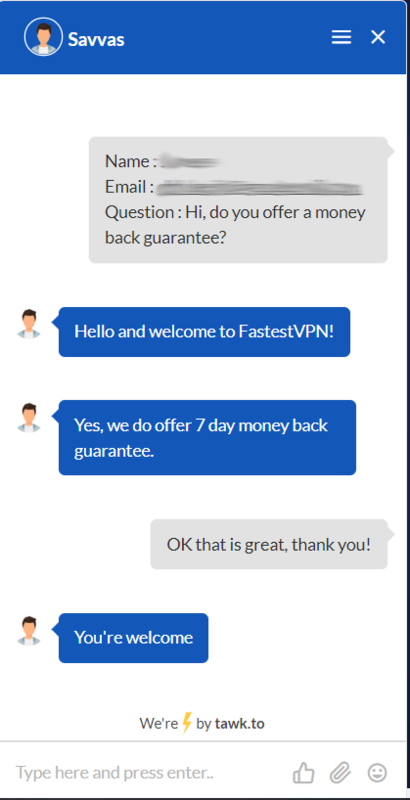 This looks promising since FastestVPN claims to respond to all customer support queries through their email within 24 hours, and through live chat as soon as possible. They do, however, collect some information for customer support such as your email address; if you’re privacy-conscious, make a throwaway email, as your activities using the VPN aren’t logged – perfect if you’re doing things you don’t want to be connected to. Although FastestVPN supports six tunneling protocols—PPTP, TCP, UDP, IKEV2, L2TP, and OpenVPN—for complete flexibility, the application defaults to using PPTP which is one of the least secure ones available. If you are not careful, this can catch you out. 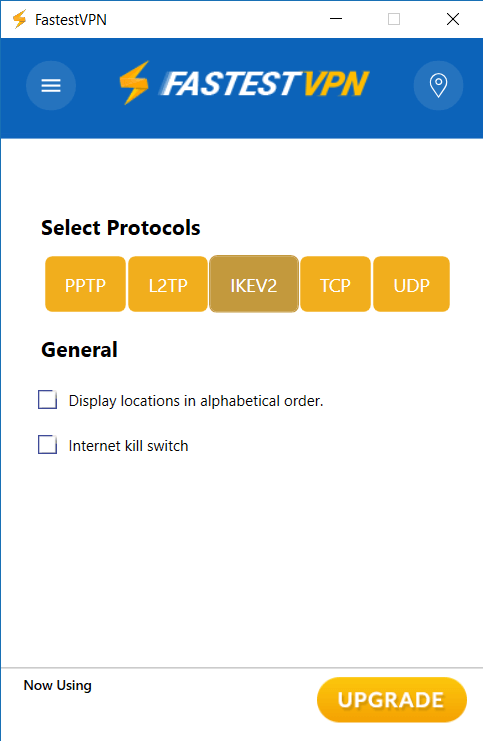 Luckily, it is easy to switch between protocols in the app’s settings. If you want to use OpenVPN, however, you will have to manually install it yourself. Although FastestVPN supports it, it does not come included as standard. IP & DNS Leaks: N0 leaks! Leaking can kill what would be an otherwise good VPN. The point of a VPN is to protect your personal data but, if it is leaked, you’re at risk. Connection leaks can obliterate all other factors including encryption and secure protocols. FastestVPN has a kill switch built in that can be toggled under settings. A kill switch will protect your IP address from third-parties even if your connection to FastestVPN drops. FastestVPN has servers spread out across 22 different countries and they’re adding more. You can even request a server location and they will add it if there’s enough demand. Unfortunately, we can’t find any information on exactly how many servers are on offer here – just a list of countries. That doesn’t inspire confidence, but the fact you can request server locations is a nice touch. All FastestVPN plans come with a 7-day money back guarantee, no questions asked. Simply email customer support and they will process it for you. On all six of these servers, we got the dreaded Netflix error informing us that we were using a VPN and therefore no content could be displayed. Their FAQs explicitly state that there is currently no support for Netflix; a shame. Better go with another VPN for access to Netflix. Luckily, we’ve already made a list of our top 10 picks. 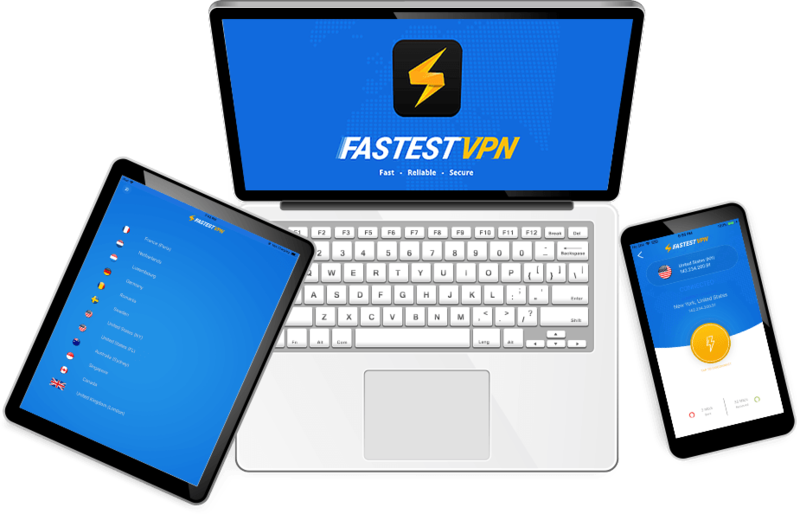 FastestVPN’s mission is to provide you a seamless VPN experience with their fast and secure network connections. It is a service provided by a team of dedicated IT specialists and is headquartered in the Cayman Islands. FastestVPN’s parent company is located in the Cayman Islands, and this is a massive plus. The Cayman Islands are famed for being privacy-conscious; you’ve probably heard jokes about how certain people or companies have their bank accounts here. This is because banks and other companies here will not disclose their customers’ or clients’ information to third-parties. As a country that is not a member of the Five, Nine, or Fourteen Eyes parties where countries agree to share information and data with each other, this is an indication that your information, if any is available, will never be disclosed to law enforcement agencies or government authorities. We were pleasantly surprised by FastestVPN and they have certainly somewhat lived up to the name. Although they are not the fastest VPN service, their speeds are good and they offer a vast range of servers and locations. Customer support is great, the app is easy to use, it won’t break the bank and there are lots of payment options for you to choose from, all that’s missing are anonymous payment options. We detected no leaks when testing it out and there’s an optional kill switch. One place they can improve is not making the tunneling protocol default to PPTP as it’s not very secure, and include OpenVPN by default within the app rather than having it as a manual install. 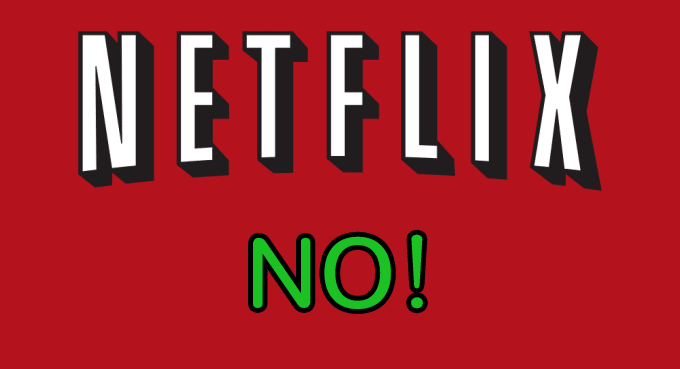 Although Netflix doesn’t work, we won’t hold this against them as many VPNs struggle here as Netflix now crack down on it. All around, however, we are pleased—this is a solid VPN choice. 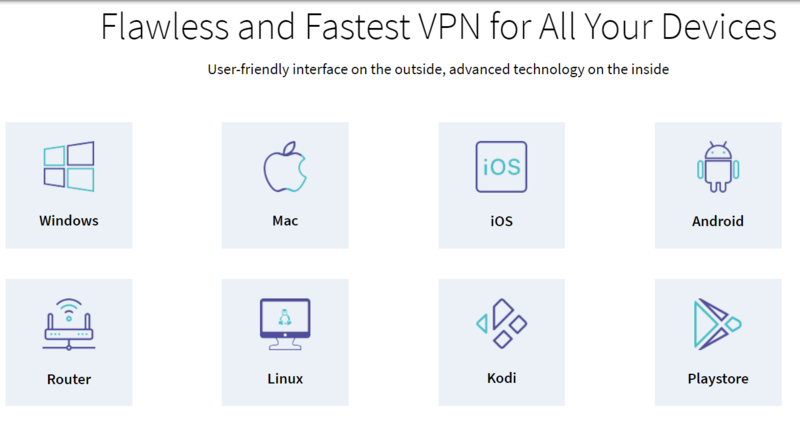 If you think FastestVPN lacks some core features you need, we recommend you look at the VPNs on our top 10 list. They come with full features and may have just what you need.